For media inquiries, please contact Isabel Payne at isabel@cansia.ca. Please see below for the latest CanSIA and industry news releases and updates. March 22, 2019 - On Tuesday, March 19th, Finance Minister Bill Morneau released the Federal Government's 2019 Budget in the House of Commons. Titled Investing in the Middle Class, the Budget announced significant new investments in moving Canada to a cleaner energy future based on renewable power and smart technologies. February 15, 2019 - Three new solar electricity facilities to be built in south eastern Alberta (Canada) have been selected through a competitive process to supply the Government of Alberta with 55 per cent of their annual electricity needs. The facilities will be built near Hays, Tilley, and Jenner, by Canadian Solar with Conklin Métis Local #193 as 50-percent equity owners. January 24, 2019 - Earlier today, the Honourable Amarjeet Sohi, Federal Minister of Natural Resources announced support from the Emerging Renewable Power Program for the Suffield Solar Project. The $50 million project developed by Canadian Solar Solutions Inc. and located near Suffield, in Southern Alberta will be the first in Canada to use bi-facial solar photovoltaics at a large-scale. This emerging technology captures solar energy from both the top and the bottom sides of the solar module while tracking the sun through the sky from sun-rise to sun-set. July 13, 2018 - Today the Ontario government announced the cancellation of 758 renewable energy contracts. The vast majority of the contracts (over ninety per cent) are small, rooftop contracts owned by farmers, schools, municipalities and First Nations. Any savings to Ontarians’ hydro bills attributed to the cancellation would be negligible. June 29, 2018 - Today, the Government of Ontario announced the appointment of the Honorable Greg Rickford as Ontario’s new Minister of Energy, Northern Development and Mines, and Minister of Indigenous Affairs. The Canadian Solar Industries Association (CanSIA) welcomes the opportunity to support Minister Rickford in fulfilling the government’s commitment to lower electricity bills for Ontario families, businesses and its diverse communities. May 1, 2018 - The Ontario Minister of Environment and Climate Change, Chris Ballard, has announced a new solar energy and energy storage program which will run through the Green Ontario Fund. ​Read CanSIA's full press release here. February 28, 2018 - The Federal Government continues to build on Canada’s national climate action and clean growth efforts with the proposal to extend the Accelerated Capital Cost Allowance (ACCA) for energy efficiency and clean energy technology by five years in the Business Income Tax Measures in Federal Budget 2018. ACCA is an important tax policy previously scheduled to sun-set in 2020 that enables businesses who make investments in technologies such as solar energy to defer taxation to later years thus enabling them to better manage their energy costs and encouraging them to make lower-carbon investments. Read CanSIA's full press release here. March 23, 2017 - 21st Century electricity system is a driver for climate action and clean technology for clean growth. 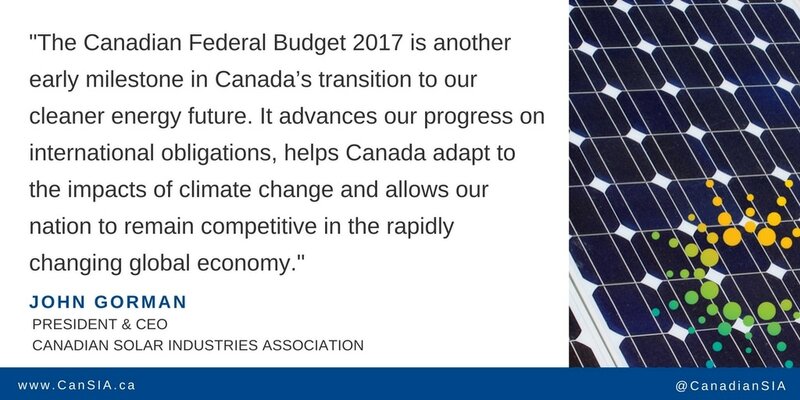 CanSIA released a full statement regarding Canadian Federal Government's first budget yesterday since ratifying the Paris Agreement. February 27, 2017 - The Canadian solar industry is primed to participate in the Government of Alberta’s newly launched Residential and Commercial Solar Program – a 36 million dollar program supporting the installation of solar electricity generation on residential, multi-residential and small commercial roofs across the province with the goal of achieving 10,000 new solar roofs. November 2, 2016 - The Federal Government has announced that by 2025, 100% of electricity used in their buildings and operations will be from renewable energy sources. This target is in support of a target to reduce the Federal Government's greenhouse gas emissions by 40% as early as 2025. CanSIA states generating solar electricity on roofs of schools will inspire children and invigorate their entire learning experience. October 26, 2016 - As part of its Climate Leadership Plan, the Alberta Government has committed to including solar electricity generation in each of the province's 36 new schools in the planning or design phase. October 6, 2016 - The Canadian Solar Industries Association (CanSIA) states that the Government of Alberta is leading by example as the first provincial or territorial government in Canada to explore the feasibility of meeting 50% of their annual electricity needs from solar energy. Minister Shannon Phillips, Alberta’s Minister of Environment & Parks (and Minister responsible for the Alberta Climate Change Office) announced their intent today at the Solar West 2016 conference in Edmonton, hosted by CanSIA for the solar energy industry. Read the full press release here. September 27, 2016 - John Gorman, President and CEO of the Canadian Solar Industries Association (CanSIA) released this statement following today's announcement that Ontario will suspend the second round of its Large Renewable Procurement (LRP II) process. CanSIA is pleased to see that 7 projects for 139.885 MW of the 140 MW solar Procurement Target have been awarded through the process. We now have the technology that can increasingly compete with fossil fuels. Costs for solar have come down 50% in the last five years alone.